The Fantasy Comic League blinds you with science in the month of February. Weapon X’s most recent science experiment gone wrong, Weapon H, takes center stage and stars in potentially the weirdest event in recent memory. 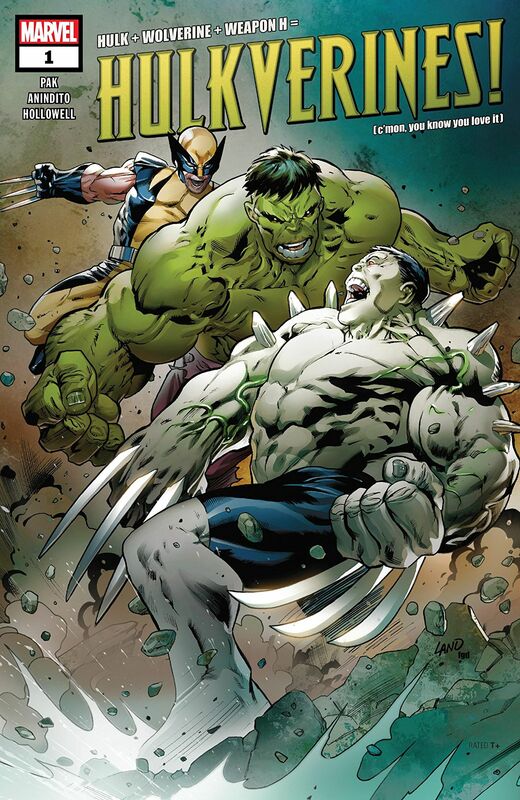 The Hulk and Wolverine, his predecessors and unwilling genetic donors, face Weapon X in Hulkverines. But while they are busy crossing claws and testing their strengths, a quartet of other scientists are working together. Iron Man responds to Shuri’s call for help in her solo title, while Doctor Strange helps Moon Girl get to the bottom of her recent bad dreams in her book. Other books which will test the chemistry of characters are Miles Morales: Spider-Man when Captain America teams with the young hero; Jessica Jones and Deadpool when the merc hires the surly sleuth for unknown reasons; and Squirrel Girl which has regularly featured character cameos, this time it’s Peter Parker, Thor and She-Hulk. Wolverine tops the Fantasy Comic League previews and completes his return to the Prime Universe with the conclusion of the miniseries. It comes at the perfect time. Now that the majority of the X-Men are living in the Age of X-Man, it falls to Logan and Cyclops to headline the Uncanny X-Men title. Wolverine is also the latest character to get a cosmic focus with his Infinity Watch series, but it is most likely the Phoenix-imbued Logan teaming up with Loki. Additional new series starting in February include Chip Zdarsky’s Daredevil relaunch; Jody Houser’s Captain Marvel: Braver & Mightier; and Gerry Duggan’s Savage Sword of Conan, the second sword and sorcery series in as many months since Conan’s return to Marvel. Avengers: No Road Home, the next weekly event, reunites Voyager with some of Earth’s Mightiest Support Heroes. Monthly theme for the Free-for-All Themed challenge: Draft a team of only Science characters. Restrictions on team affiliations and power selections still apply. A list of eligible science-based heroes is provided at this link. Please provide your Free-for-All rosters prior to Wednesday, February 6, 2019 using the online draft form. Dopplegangers or repeat appearances of our main characters are found in the Marvel Action, Marvel Legends, Marvel Tales and Marvel Super Hero Adventures books as well as any MCU tie-in series and thus do not count for their prime universe counterparts. 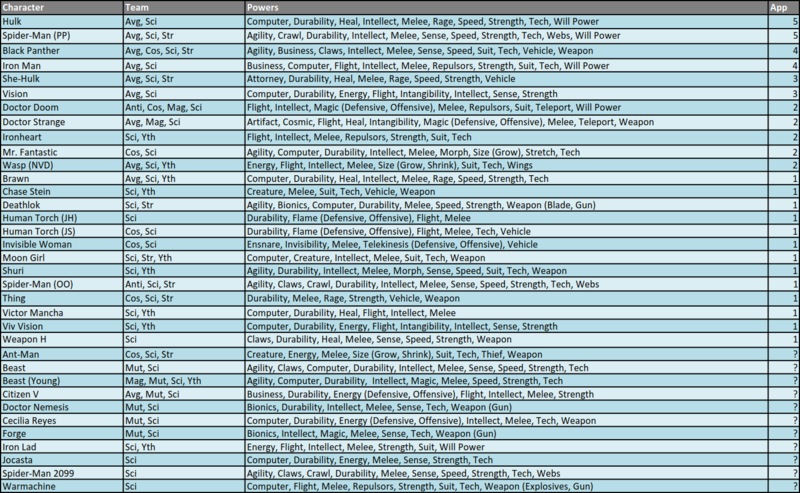 Please see the attached Power Summary file for further power clarifications and follow along with our #FantasyComicLeague tweets on Twitter for official power scoring and discussions. Appearance estimates, based on comic solicitations and cover artwork provided by the Marvel Database wiki, are meant as a guideline and not an indication of a specific draft order. Character names, team designations and power sets conform to the most current information provided by the Database.